Thyroid nodules are common with varying incidence in different populations. They are commonly benign, more common in women with increased incidence with increasing age, iodine deficiency and radiation exposure. USG is the preferred means used by endocrinologists for picking non –palpable thyroid nodules. Studies have suggested detection of thyroid nodules in 3-6 % of population on palpation with detection rates as high as 67 % on USG. USG provides simple, cost effective, non invasive, non radiation means for this goal. Various GS and CD parameters have been extensively evaluated with variable results but still there is no practical standardized reporting format for assessing thyroid nodules radiologically. This study was done to assess the comparative as well as collective role of various GS and CD parameters in distinguishing benign from malignant thyroid nodules. Using this array of parameters we have also tried to suggest a scoring system for predicting malignancy in thyroid nodules. This scoring system aims to bring uniformity and objectiveness by providing a standardized reporting format for radiological evaluation of thyroid nodules. This prospective descriptive analytical study was carried on 140 euthyroid patients with non palpable, clinically suspected thyroid nodules at Teerthankar Mahavir Medical College and research center Moradabad, Uttar Pradesh over 20 months from August 2014 to March 2016. The institutional ethical committee approved the study and informed consent was taken from all the participants. Mean age of study group was 39 years. Female participants were 86 out of 140. Patients with multiple or palpable nodules were excluded as were cases with inadequate FNAC results. Only patients with normal thyroid function tests (T3, T4, TSH levels) were included in the study. All the patients were examined with Siemens ACUSON S2000™ ultrasound system (Siemens, Berlin, Germany) with multi-transducer. The transducer used in this study was a 5-14 MHz linear array transducer. On GS: nodules were evaluated for internal contents, echogenicity, halo, margins and calcification. Internal contents were classified as cystic, solid, cystic with septations or mixed solid and cystic. On the basis of echogenicity, nodules were hypoechoic, hyperechoic, isoechoic or anechoic. 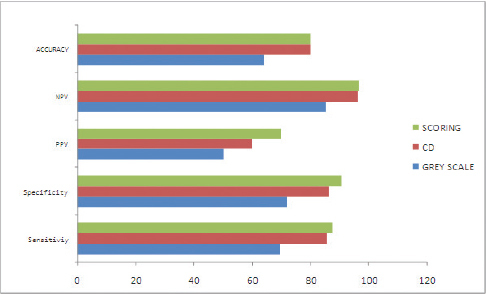 Halo was either thin (upto 2mm) or thick (>2mm), while margins were well or poorly defined. Calcification if present was categorized as micro calcification </= 2mm in diameter, coarse calcification >2 mm or peripheral egg shell calcification. On CD; nodules were evaluated for pattern of blood supply, spectral parameters. Pattern of blood supply was categorized as type 1: avascular, type 2: only perinodular flow, type 3: predominant perinodular flow with some intranodular flow, type 4: predominant intranodular flow and type 5: exclusively intranodular flow. This classification has also been used in earlier studies like one by Chammas et al. Thereafter spectral parameters including PI and RI were obtained by applying pulse wave on three vessels in each nodule and averaging the findings to obtain final values. Two intranodular and one perinodular vessels were chosen when flow was demonstrated in both locations. 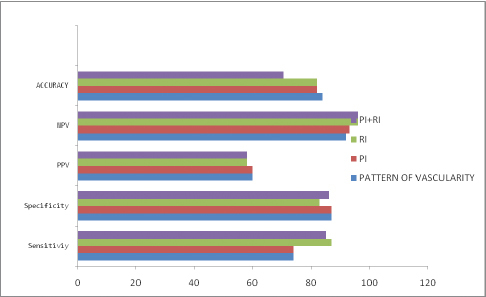 Five GS and three CD parameters were given a score of 0-2 as shown in [Table 1]. Depending on the total score the lesions were categorized as benign (score upto 8) or malignant (score > 8). Histopathological reference diagnosis was provided by FNAC. Follicular neoplasms were further subjected to biopsy. 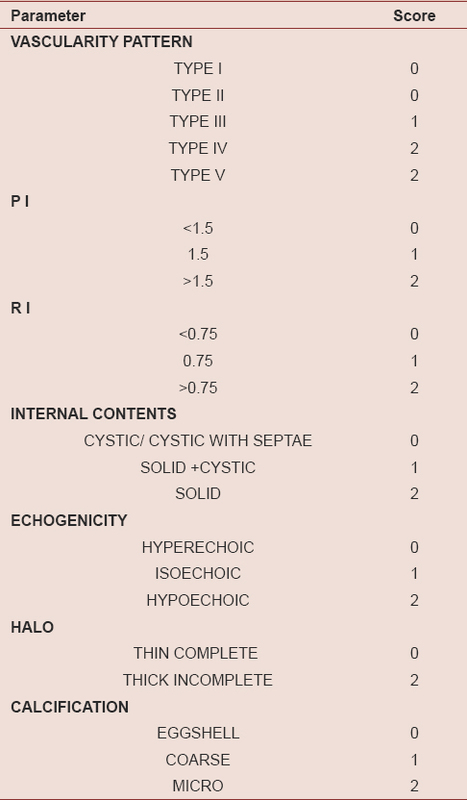 Sensitivity, specificity, PPV, NPV, accuracy and p value was calculated independently for GS USG, CD and total score [Figure 1],[Figure 2],[Figure 3] using statistical calculation softwares MEDCAL and GRAPHPAD. 112 out of 140 nodules were benign and rest 28 were malignant on FNAC /biopsy correlation. 10% nodules were purely cystic. 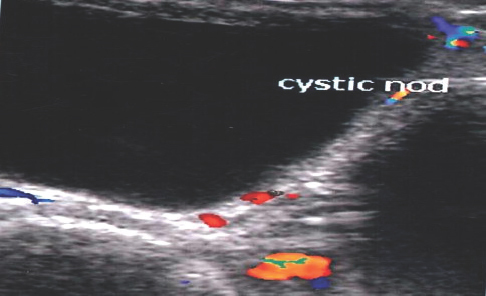 Cystic nodules with septae were seen in 12.5% cases, solid nodules with cystic components were seen in 37.5% and 40% nodules were purely solid. Hypoechogenicity was seen in 35% nodules whereas 15% nodules were isoechoic. 32.5% nodules were hyperechoic and anechoic nodules were seen in 7.5% cases. Sharp well defined margins were seen in 72.5% nodules whereas poorly defined margins were seen in 27.5%. Thin complete halo was seen in 67.5% nodules while 32.5% nodules showed thick incomplete halo. No calcification was seen in 65% nodules while peripheral egg-shell calcification was seen in 7.5%. Coarse calcification was seen in 7.5% nodules and micro calcification in 20% nodules. 17.8% benign nodules were purely cystic while 12.5 % benign and 7% malignant nodule were cystic with septae. Solid with cystic components were seen in 44.6% benign nodules and 14.3% malignant nodules while 30.3% benign and 78.6% malignant nodules were predominantly solid. 21.4% benign nodules were anechoic. Hypoechogenicity was seen in 28.6% benign and 100% of malignant nodules. 16.1% benign and 14.3% malignant nodules were isoechoic. Hyperechogenicity was seen in 34% benign nodules while 21.4% malignant nodules were hyperechoic. Sharp well defined margins were seen in 80.3% benign nodules and in 35.7% malignant nodules while poorly defined margins were seen in 11 benign and 9 malignant nodules. Thin complete halo was seen in 19.6% benign nodules and in 21.4% of malignant nodules while thick incomplete halo was seen in 21.4 % benign and 78.6% malignant nodules. On statistical analysis, amongst GS parameters, two features showing p value < 0.05 and hence statistically significance were poorly defined margins and thick incomplete halo. CD : Type I vascularity pattern was seen in 2.5% nodules, Type II pattern in 17.5% of nodules, Type III in 55%, Type IV in 25% while Type V pattern was not seen in any nodule. PI > 1.5 was seen in 25% while 72.5% of nodules had PI<1.5. RI was>0.75 in 30% nodules whereas 67.5% of nodules had RI <0.75. 3.125% benign nodules and none of malignant nodules had Type I blood flow pattern. 21.875% of benign nodules and none of malignant nodules had Type II blood flow pattern. Type III blood flow pattern was seen in 62.5% of benign and of 25% malignant nodules. 9.375% of benign and 75% of malignant nodules had Type IV pattern of blood flow. 84.375% of benign nodules and 25% of malignant nodules had PI<1.5. 12.5% of benign nodules and 75% of malignant nodules had PI>1.5. RI <0.75 was seen in 81.25% of benign and of 12.5% malignant nodules. 15.625% of benign and 87.5% of malignant nodules had RI>0.75. Figure 7: showing hyperechoic solid+cystic well defined nodule with thin complete halo and no calcification, type III vascularity pattern. On statistical analysis, all the three parameters on CD examination were found to be statistically significant for predicting malignancy in thyroid nodules. PI was found to be highly significant (p<0.001) while RI was found to be highly significant (p<0.001). Scoring used showed higher values of sensitivity, specificity, PPV, NPV as well as accuracy when compared to GS USG or CD [Figure 3]. In our study , significant differences in benign and malignant nodules were shown by all included features [Figure 4]. 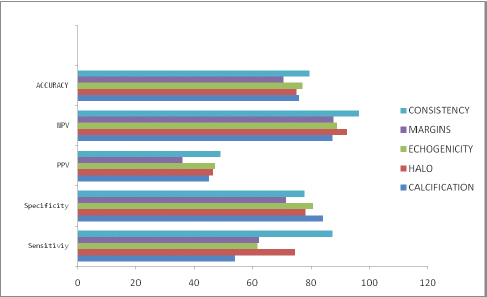 Collectively GS showed sensitivity, specificity, PPV, NPV, accuracy of 69.2%, 71.9%, 50%, 85.2% and 64% respectively. Two features i.e. halo and margins in decreasing order were found to be most significant (p<0.05).In agreement with our results, T Rago et al found absent halo sign to be most significant amongst grey scale parameters for predicting malignancy (P = 0.0001; specificity 77.0%; sensitivity 66.6%). Yoon JH et al found echogenicity, margins and microcalcification to be statistically significant predictors of malignancy. Pompili G et al also found halo sign, margins and echogenicity most useful parameters in differentiating benign from malignant lesions. Irregular borders had the highest specificity (93%), positive predictive value (80%), and accuracy (78%) for malignancy in study by Batawil N and Alkordy T. Iannuccilli et al found micocalcification to be only useful criteria in predicting malignancy in thyroid nodules. In our study, CD parameters together showed sensitivity, specificity, PPV, NPV , accuracy to be than GS USG. These values for CD were 85.4%, 86.2%, 60%, 96% and 80% respectively [Figure 4],[Figure 5],[Figure 6]. RI was found to be most highly significant (p value <0.0001) followed by PI (p value <0.001) and pattern of vascularity (p value<0.05). Iared W et al found internal vascularity to be predictive of malignancy in follicular neoplasms with sensitivity, specificity, PPV and NPV being 85%, 86%, 51% and 97%, respectively. In concordance with our study, mean RI values of 0.75 in carcinomas and lower in benign nodules were reported by De Nicola et al. RI more than 0.75 was found to be most sensitive (81.8%) and most specific (98.6%) feature predicting malignancy in thyroid incidentalomas by Hesham Algazzar et al. JQ Zhou et al found significant differences in PI and RI values in benign and malignant nodules but found PI to be statistically significant in determining malignancy. Reduced vascular resistivity is seen in malignancies elsewhere in body. RI values in thyroid malignancies have been seen moving obverse to this trend. This can be appertaining to extensive stenosis, occlusion and fistulas in the chaotic blood supply of thyroid malignant nodules. Figure 5: showing: a) Isoechoic solid-cystic well defined nodule with thin complete halo and no calcification. b) type IV pattern of vascularity c ) spectral parameters in perinodular vessel. 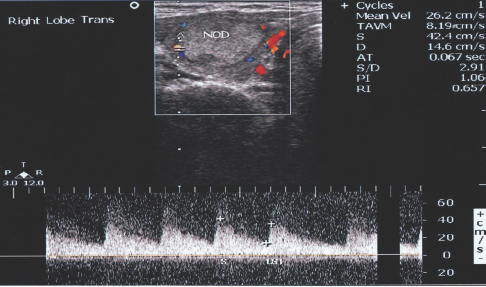 Figure 6: showing spectral parameters in a hyperechoic solid cystic well defined nodule with thin complete halo and no calcification , type III vascularity pattern. Scoring system: proposed in this study makes use of five GS and three CD parameters including spectral parameters and showed sensitivity, specificity, PPV , NPV, accuracy of 87.5%, 90.6%, 70%, 96.7% and 80% respectively .These values were higher than shown by GS USG or CD. TIRADS was first introduced by Horvath et al using GS USG features and nodule vascularity showing sensitivity , specificity , PPV , NPV and accuracy of 88%, 49% , 49% , 88% , 94 % respectively. Another scoring system by Kwak JY did not include CD parameters. 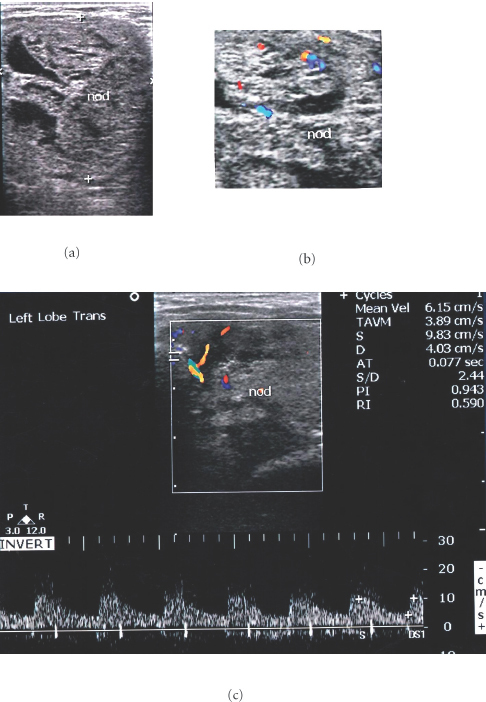 Scoring system for evaluation of thyroid nodules was also suggested by J Fernandez Sanchez but was not statistically analyzed and did not include spectral parameters. Use of elastography was deliberately skipped in this study considering inconclusive results in literature and also the fact that elastography is not available commonly in clinical practice in countries like ours, hence aiming to make the scoring easily adaptable in everyday radiology practice. This study incorporating spectral parameters into scoring of thyroid nodules encompasses a small sample size as compared to study that has introduced TIRADS. This is a pilot study evaluating a new scoring. Evaluation of scoring parameters on a larger sample size might open gates to additions, improvements in existing scoring systems. CD is better than GS USG in predicting malignancy in thyroid nodules. Scoring used in this study encompassed GS as well as CD parameters and proved better than GS or CD in differentiating benign from malignant thyroid nodules. Hesham Algazzar, Ashraf Talaat, Mohamed El-Assal, Amr M. Elhammady, Ayman M. ELbadawy, Elsayed Kaoud et al . Thyroid Incidentaloma: Risk of Malignancy as Assessed By Sonographic and Color Duplex Features. Life Science Journal 2013; 10(4):3677-83. Sanchez JF. 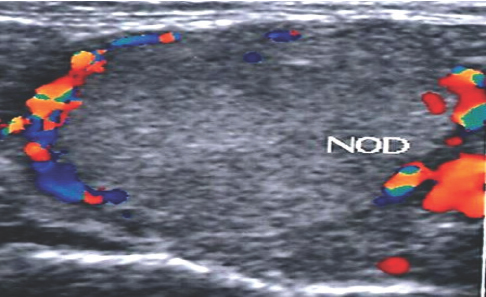 TIRADS classification of thyroid nodules based on a score modified according to ultrasound criteria for malignancy. Rev.Argent.Radiol.2014; 78(3):138-48. Dr Jyoti Aggarwal, Associate Professor Biochemistry MMIMS&R, Mullana Ambala, Haryana, India. She has 8 years of teaching experience and she has 6 publications as first author in the International journal of repute. Her area of Interests include Clinical Biochemistry; with special interest on emerging bio-markers in CAD. Dr Seema Awasthi, Professor, Pathology,TMMCRC, Moradabad, UP India. She has more than 10 years of teaching expereince, more than 30 national and international publications. Her area of interests include histopathology etc.